Stanford researchers have developed a new material that can stretch to 100 times its original length by exposing it to an electric field, and even repair itself if punctured, making it potentially useful as an artificial muscle. Artificial muscles currently have applications in some consumer technology and robotics, but small holes or defects in the materials currently used make them less resilient, and they can’t self-repair if punctured or scratched, according to Stanford chemical engineering professor Zhenan Bao. The new material (Fe-Hpdca-PDMS polymer film) has remarkable self-healing characteristics. 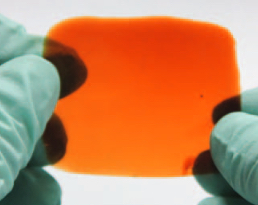 Damaged polymers typically require a solvent or heat treatment to restore their properties, but the new material can heal itself at room temperature (even if the damaged pieces are aged for days) and at temperatures as low as negative 4 degrees Fahrenheit (-20 C). The team attributes the extreme stretching and self-healing ability to a chemical bonding process known as crosslinking. To create it, they designed special organic molecules to attach to the short polymer strands in their crosslink to create a series of structure called ligands. These ligands joined together to form longer polymer chains (spring-like coils with inherent stretchiness). Then they added metal ions, which have a chemical affinity for the ligands. When this combined material is strained, the knots loosen and allow the ligands to separate. But when relaxed, the affinity between the metal ions and the ligands pulls the fishnet taut. The result is a strong, stretchable and self-repairing elastomer. They have to do more work to increase the degree to which the material expands and contracts and control it more precisely. This research dovetails with Bao’s efforts to create artificial skin that might be used to restore some sensory capabilities to people with prosthetic limbs. This work in the development of strong, flexible, electronically active polymers could also spawn a new generation of wearable electronics, or medical implants that would last a long time without being repaired or replaced, says Bao. The research is described in the current issue of Nature Chemistry. It was supported by the Air Force Office of Scientific Research, Samsung Electronics, and the Major State Basic Research Development Program of China. It is a challenge to synthesize materials that possess the properties of biological muscles—strong, elastic and capable of self-healing. Herein we report a network of poly(dimethylsiloxane) polymer chains crosslinked by coordination complexes that combines high stretchability, high dielectric strength, autonomous self-healing and mechanical actuation. The healing process can take place at a temperature as low as −20 °C and is not significantly affected by surface ageing and moisture. The crosslinking complexes used consist of 2,6-pyridinedicarboxamide ligands that coordinate to Fe(III) centres through three different interactions: a strong pyridyl–iron one, and two weaker carboxamido–iron ones through both the nitrogen and oxygen atoms of the carboxamide groups. As a result, the iron–ligand bonds can readily break and re-form while the iron centres still remain attached to the ligands through the stronger interaction with the pyridyl ring, which enables reversible unfolding and refolding of the chains. We hypothesize that this behaviour supports the high stretchability and self-healing capability of the material.